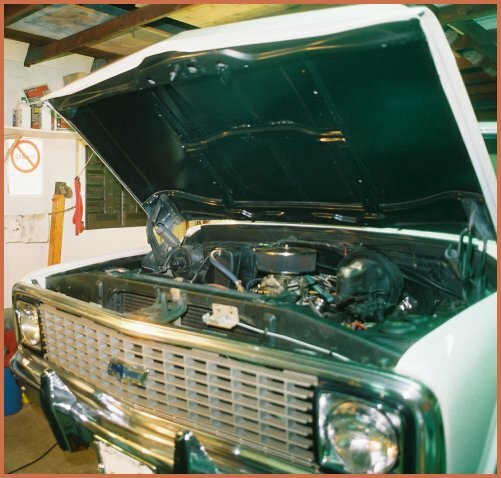 This is the mechanical section containing technical information and detailed photos of the modifications done to a 1971 Chevrolet C-10 pickup truck. Before going into the technical and mechanical aspects of what has been done to modify this 1971 Chevrolet C-10 pickup, I want to spend a moment to address the the financial impact of what all these modifications translate into. We have all heard it, that old saying " too much to list " and, in most cases, there is quite a bit of truth to such a statement, as is the case here. As we all know there are numerous items used in a custom build and or restoration that are expensive and sometimes not easily seen because the item or product is hard to photograph in its entirety when installed in the vehicle. Take for example the yards of braided steel lines and AN fittings used on this 1971 Chevrolet C-10 build  because of time constraints ( being that I'm wearing the hats of designer / builder / mechanic / fabrication guru and photographer ) I couldn't really devote the time to halt "construction" to capture a step-by-step photo essay regarding the full amount of braided steel line used on the truck. Instead the photos show "glimpses" of the braided line  leaving what was technically involved to install this braided line to the mechanical expertise of those viewing this web site. 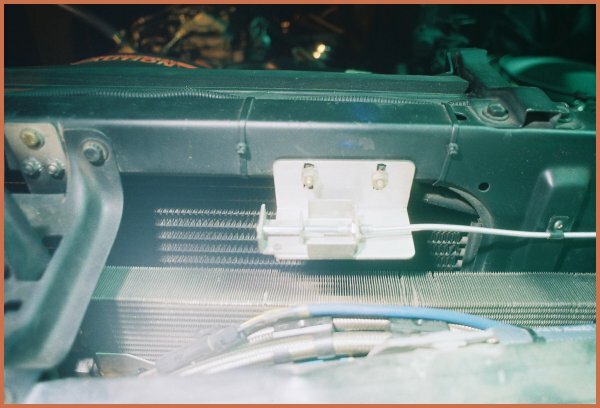 In other words, I am assuming that the viewer knows approximately how many feet of braided line and the number of AN fittings that are needed to install those lines when a photo shows an installed dual circuit engine and transmission oil cooler which has been connected ( plumbed ) with braided steel lines. However, even when a viewer of this web site knows what is involved for such an installation, this knowledge still does not address the monetary cost of the installation task and that's where receipts come in to play  and as you will see as you scroll down this page, I have plenty of receipts, which are, of course, included in a file for the buyer of this truck. What follows here is a partial list of product either installed on the truck or to be installed on the 383 cubic inch stroker engine I have on the stand for this truck. NOTE: The items installed on the 350 cubic inch engine are all transferable to the 383 cubic inch stroker engine, for example, the March belt drive system. Holley Carburetor Model 4150, 600 cfm, Square Bore, Manual Choke, 4-Barrel, Dual Inlet, Dichromate. 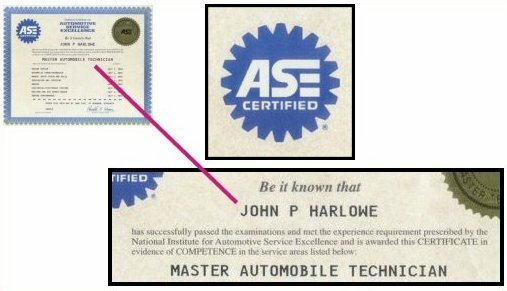 Choke Kit, Electronic Choke, Holley 2300, 4150 Models. Holley 20-88 - Holley Throttle Cable Bracket. Holley 20-45 - Holley Transmission Kickdown Bracket. Aeroquip FCP0102 Fuel Line Braided Stainless Steel Holley 4160 # 6 AN Inlet. K and N 85-0200 Stubstack Polyurethane Black for Holley, 4150 / 4160 carbs. Energy Suspension 3-4108G Body Mount Bushings Polyurethane, Black, Chevy, GMC, C10/C15/C1500 Pickup, Set of 12. Milodon 16210 Water Pump, Mechanical, Long, High-Volume, Iron, Natural. Milodon 16400 Thermostat, 160 Degree, High-Flow, Steel. Trans-Dapt Performance Products 4134 Differential Cover, Aluminum, Natural, GM, 12-Bolt, Truck. Tru-Max BLIP12406 - Tru-Max Super Insulator Mats Heat Barrier, Super Insulator Mat, 48 in. 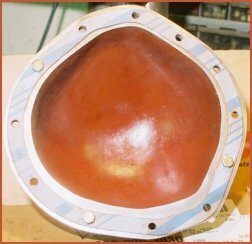 x 72 in., Universal, ( used for fuel tank area ). ARP 134-2501 Harmonic Balancer Bolt, Chromemoly, Black Oxide, 12-Point. ARP 234-1901 Oil Pan Studs, Black Oxide, Hex Nut. Design Engineering DEI 010402 Versa Shield, Starter Wrap, 7 x 24 in., Self-Attaching Velcro. Flex-a-lite 1307 Fan, Flex-Type, Wide Blade, Clockwise, 17 in. Diameter, Stainless Steel Blades/Steel Hub. March Performance 22050 - March Performance Chevy Small Block Serpentine Conversion Kit. March Performance P300 Power Steering Pump, Saginaw P Series, Buick, Chevy, Oldsmobile, Pontiac. Milodon 17050 Oil Pump Stud Kit Hex Head, Chromemoly, Black Oxide. Milodon 18307 Oil Pump Pickup Press Fit, Aftermarket Pan Style. Milodon 18750 Oil Pump, High-Volume. Milodon 31503 Oil Pan, Steel, Gold Iridite, 5 qt. 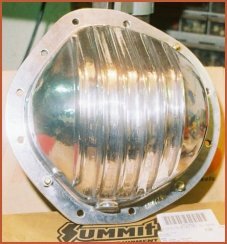 Summit Racing SUM-G3230 Timing Cover, 2-Piece, Steel, Chrome Plated. COMP Cams 310 3-Piece Billet Aluminum Timing Cover. Tavia 02356 Timing Pointer, Billet Aluminum, Black, Adjustable, 8 in. Trans-Dapt Performance Products 1022 Adapter, Oil Filter Bypass, Spin-On, Aluminum, Natural, 13/16-16 in. Thread, 1/2 in. NPT Inlet/Outlet. Trans-Dapt Performance Products 1048 Oil Filter Relocation Hose Kit 48 in. Long x 1/2 in. Diameter, 1/2 in. NPT Male Ends, Pair. Summit Racing SUM-642022 Exhaust Crossover Pipe, H-Style Balance Tube, Steel, Aluminized, 2.25 in. Diameter. ARP 134-7901 Oil Pump Driveshaft Kit. Summit Racing SUM-G1792 Camshaft Lock Plate, Steel, Black Oxide. Summit Racing SUM-G3865 Dipstick with Tube, Engine, Steel, Chrome. Russell Performance 639590 Brake Bleeders, Speed Bleeders, 3/8 in.-24 Thread, 1 in. Overall Length, Steel. TCI Auto 328000 Automatic Transmission Pan, Deep, Aluminum, Natural, GM, TH350. COMP Cams 2100 Cams Magnum Double Roller Timing Set. COMP Cams CL12-212-2 Cam and Lifters, Hydraulic Flat Tappet, Advertised Duration 280/280, Lift .480/.480. Fel-Pro QKS2600 Gaskets, Full Set. Hurst Shifter 3838510 Automatic Shifter, Pro-Matic, Chrome. Milodon 32250 Diamond Stripper Windager Tray. Milodon 32610 Lifter Valley Baffle. Milodon 81150 Windage Tray Stud Kit. Summit Racing SUM-G1790 Block Protector Kit. TCI Auto 328800 - TCI Pro Super Transmission Overhaul Kit. TCI Auto 322200 - TCI Street Fighter Valve Body. Weiand 8016 Stealth Intake Manifold. A new 4 core H.D. Radiator Assembly. H.D. Hellwig FRONT and REAR 1 1/8 inch 4140 chromolly steel swaybars with polyurethane bushings. Trans-Dapt Performance Products 1155 Remote Transmission Filter 3/8 in. NPT Thread. New rear Axle bearings and seals. New front and rear brake hoses. New rear brake drums, wheel cylinders, hardware kit and shoes. 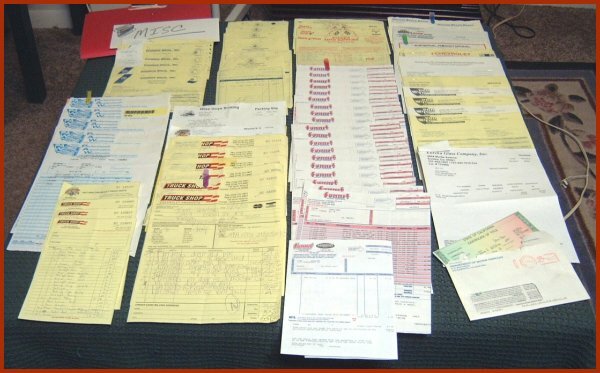 Of course the entire point of making this partial list and showing a photo of the receipt file is to make potential buyers of this 1971 Chevrolet C-10 pickup aware that quite a bit of money was spent on the build of this truck and that my statement of " too much to list " is indeed factual. Now that I have brought this awareness about for the web site viewer , I'll move on now to the technical and mechanical aspects of this build. Keeping the money spent on this modified 1971 Chevy C-10 pickup safe with a cable operated hood lock as seen in PHOTO M2 which assists in protecting the valuable engine compartment contents from sticky fingers. 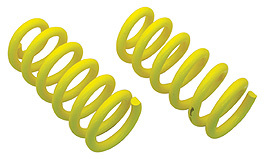 PHOTO M3 shows the 3 inch drop front coil springs from Classic Performance Products. Note that the front caliper(s) have been overhauled and fitted with new pins and O ring hardware, the brake hoses, disc rotors and pads have been replaced ( the disc brake pads are of the semi-metallic variety ). Additionally one can also partially see the H.D. Hellwig 1 1/8 inch 4140 chromolly steel front sway bar in the lower left area of the photo and in the center area of the photo the new brake hose. What is not obvious in PHOTO M3 is that the tie rod ends and sleeves, the upper and lower ball joints, the center link, the pitman and idler arms, the upper and lower control arm bushings and inner and outer wheel bearings have been replaced ( all the replacement suspension parts are Federal-Mogul's Moog brand items ) and I choose these because Moog is designed and built to meet or exceed original equipment quality, deliver smoother operation through each component full range of motion, resulting in more precise and responsive steering. PHOTO M4 shows the Rancho Suspension 9 position adjustable ( no lift ) front shock absorber installed on the 1971 C-10 which easily adjusts with a double O-ring sealed control knob ( seen in the photo as the black knob on the lower part of the shock ). The Rancho Suspension RS9000XL shock features a tri-tube monoflow design for maximum cooling efficiency and fade resistance, urethane bushings for maximum durability, a full displacement piston with a Nitrile piston seal, a internal rebound bumper and a 5/8 inch diameter hardened, double-chromed rod. 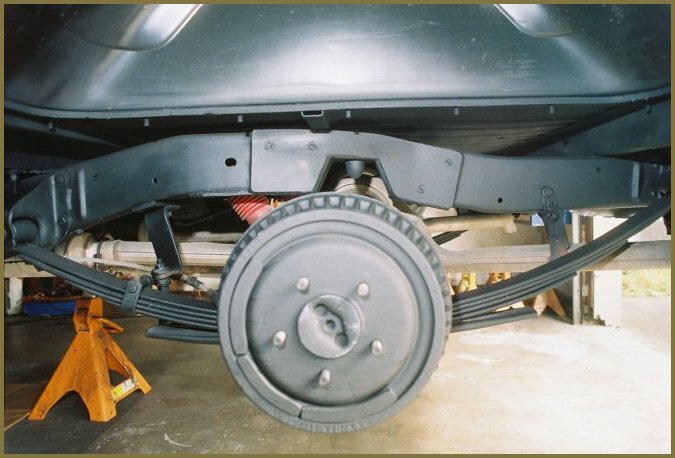 In combination with the suspension parts the 1971 C-10 also has Energy Suspension Polyurethane ( black in color ) 3-4108G Body Mount Bushings installed. All of what I have mentioned so far in combination with a new March power steering pump and a overhauledmodified power steering gearbox ( tighter steering ratio ) results in the 1971 Chevy pickup having tight, firm and responsive handling. I "road tested" the truck after all the suspension modifications / component replacement and brake handicraft were completed on a stretch of CA Highway Route 1 between Morro Bay, CA and Carmel, CA. and let me tell you this C-10 is like a slot car  it sticks to the road like nobody's business  the handling is phenomenal ! 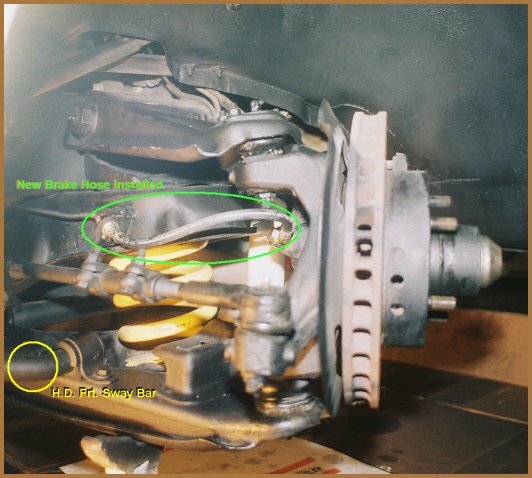 In PHOTO M5 you can see the C notched and boxed rear frame section of the 1971 Chevy pickup. The rear of the 1971 C-10 pickup also has a Hellwig 1 1/8 inch 4140 chromolly steel sway bar and Rancho Suspension shocks installed. 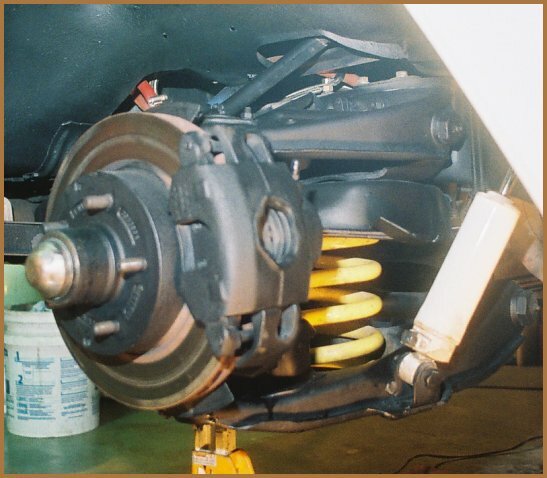 The rear brake system was also overhauled and has new wheel cylinders, brake hardware, linings, rear brake hose and drums. In PHOTO M6 A you can see the rear end cover for the 1971 Chevy C-10's 12 bolt rear end and it has been coated internally with Glyptal to increase the flow characteristics of the lubricant. In PHOTO M6 B you can see the externally polished 12 bolt rear end cover that is to be installed on the 1971 Chevy C-10 pickup. 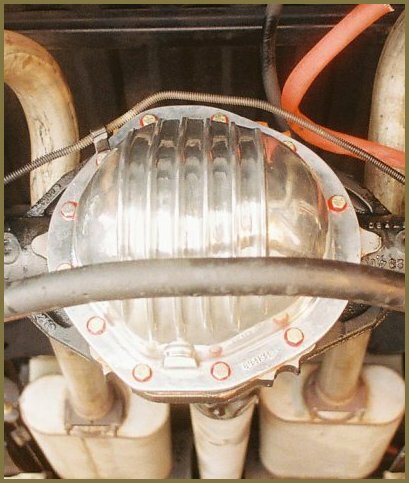 In PHOTO M6 C you can see the polished 12 bolt rear end cover installed on the 1971 Chevy C-10. PHOTO M6 D shows a close-up view of the polished 12 bolt rear end cover installed on the 1971 Chevy C-10. Also visible in PHOTO M6 D is the newly installed rear brake hose which is protected from heat by 1200 degree firebraid sheathing ( orange in color in the top right of the photo ). Even though there is adequate air space between the right side exhaust U and the rear brake hose for the heat from the exhaust pipe not to be an issue, I went ahead slipped on some firebraid sheathing because it will greatly extend the life of the brake hose. Most people would not bother with such a small detail, but I'm a detail type of guy and so this 1971 C-10 build is "sprinkled" with little details such as this. From this photo you can also get a better idea of how beefy the Hellwig sway bars are. Note that at the time this photo was taken, the exhaust wrap was not yet installed  that will bee seen in in another photo a little later on. PHOTO M6 E shows the DEI exhaust wrap installed on the C10. The exhaust wrap was sprayed with DEI's 2000 degree + ( clear ) wrap sealant to help the wrap resist road grime penetration. I also used DEI's flat white high temperature exhaust paint on the Flowmaster mufflers. There is a slight performance gain from the exhaust wrap however the main function, in this application, is to decrease the radiant heat rising up to the cab floor. So in combination with the Quiet Ride Solutions insulation installed ( SEE INTERIOR SECTION ) the C10's cab floor will be nicely protected from heat.